Michael Campion wears black high top Converse “Chuck Taylor” All Stars in the film. Patrick Muldoon wears grey high top Converse “Chuck Taylor” All Stars in the film. 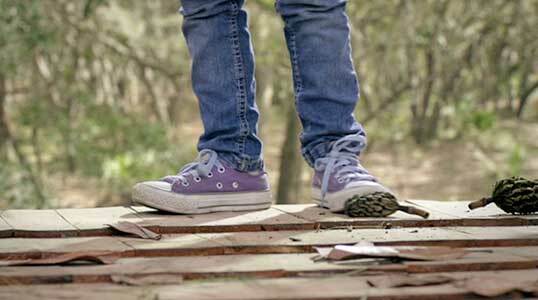 Brooklynn Prince wears purple low top Converse “Chuck Taylor” All Stars in the film. Robo-Dog standing next to the Austins and Barry Melch. Robo-Dog: Airborne, a sequel to the original Robo-Dog movie, (and not to be confused with Robodog, without the dash) begins with young Tyler Austin (Michael Campion) showing us his best friend, Robo-Dog. Robo-Dog is a mechanical and Artificial Intelligence wonder terrier who can do all kinds of actions with special limbs that appear out of nowhere. The limbs have amazingly long extensions, making you wonder where they retract to in the sides of the dog. He has super speed and can even talk. But soon we find out Robo-Dog’s new capability that has just been programmed into him by Tyler’s dad and inventor Tom Austin (Patrick Muldoon): he can fly. The first scene shows Robo-Dog’s first flight test run, which starts okay but then his gyroscope malfunctions, and after a few swipes and swoops, he crashes into the street, causing a large two foot deep pothole. One would think that crash would wipe out or seriously injure Robo-Dog, but this is Hollywood, and the multi-talented mutt climbs out of the hole without a scratch on him, although a little dazed. All of this is being video-recorded by the Austin’s bumbling friend, Barry Melch (Kenny Beaumont) who is a local merchant and promoter. Barry volunteers to take on the pothole, as the Austin’s are headed off to the local science fair where Tyler is showing off his new invention, a voice activated tracking device. Tom and Tyler are posing for Barry video showing the launch of Robo-Dog into the air. At the science fair, Tyler easily wins first prize, which even includes a bag of gifts from Barry, who turns out to be a sponsor of the event. As the Austin’s are leaving the fair, a limousine pulls up, and Tom Austin is personally invited to speak at the World Science and Technology summit in New York. This is a great honor, but the date is in conflict with the state science fair that Tyler has just won access to with his win. 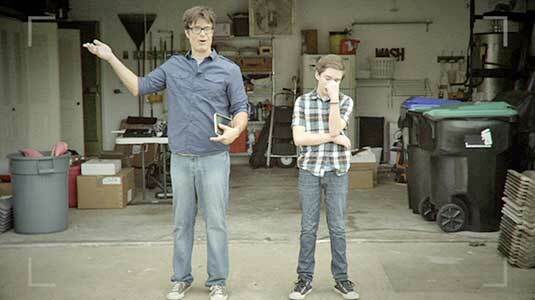 But no problem, Tom can go because Barry and Robo-Dog will go with Tyler to the state science fair. What could go wrong? Plenty, as it turns out. A display of juked up soda bottles starts exploding and flying around the displays, knocking over chemicals that catch on fire and ignite a propane tank. Robo-Dog is assisting in evacuating the kids but the explosion knocks him outside the building, where he lies injured and leaking fluid. 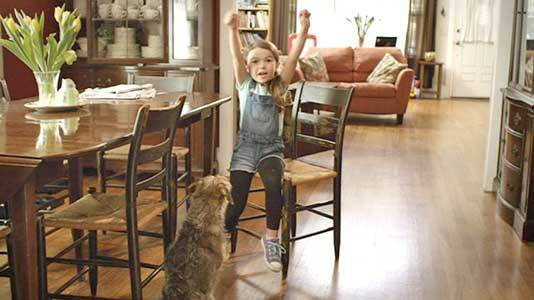 Carson Perry (Jonathan Silverman), a passing driver sees Robo-Dog and stops to help. When Robo-Dog talks back to him, Carson realizes that the dog is actually a robot who needs repair. Carson has good computer skills, so he loads Robo-Dog into his car and brings him home. Tom, Tyler, and Barry leaving the science fair. The plot now enters its next stage. Carson’s daughter Mira (Brooklynn Prince) is having a birthday, and when she spots Robo-Dog she thinks that he is her birthday gift from her father. The two have been somewhat estranged, due to family issues, and with Mira’s grandmother’s encouragement that this is the best possible gift he could have brought, Carson reluctantly goes along although he knows that Robo-Dog must be the property of someone else. But in fixing Robo-Dog, he removed Robo-Dog’s memory card so the dog has no recollection of his real owners. And now he is having the best possible relationship with Mira that he has had in years. Meanwhile, Tyler and Barry are desperate to find Robo-Dog. Will they be able to find him using Tyler’s tracking invention? Will they find him in time to go to New York, where Tom is supposed to present him at the science summit? And will they be successful in getting Robo-dog back in working order if they do find him? These issues make up the remainder of the movie. Mira is excited when Robo-Dog becomes part of her family. Robo-Dog: Airborne is another one of those “check your brain at the door” movies for the younger set that makes you wonder why it was made, especially since there wasn’t enough budget for really good CGI that everyone expects these days, and for that matter, good writers that could give the story line more believable action besides a couple of brief thrills when Mira and Robo-Dog get into slightly dangerous situations. The whole premise of the story being about a flying dog is belayed by the fact that Robo-Dog can’t successfully fly until one of the very last scenes that is totally unbelievable, even by little kids. The first flying scene at the beginning of the movie reminds you of a large helium balloon with a leak in it. And flying around has very little to do with the main story. The other thing that seems totally unbelievable is how blasé everyone else seems to be about Robo-Dog. One would think that Robo-Dog would be everyone’s center of attention at these science fairs, instead of volcanoes or even Tyler’s voice activated tracking device. And wouldn’t it be pleasant to watch a kid’s movie that doesn’t have a bumbling adult character and lame toilet humor? There are a few good morality lessons in the story and the actors do the best job they can with the weak script. It’s disappointing that a movie meant to engage kids about science, invention, and the pursuit of careers in those areas has so little real science in it. Watching this movie you have to ask yourself: Why do so many movies supposedly about science always end up being science fiction? Carson reaches out to rescue Mira from the roof. 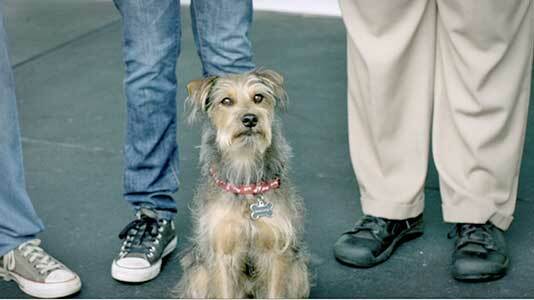 The opening shot of the film shows Robo-Dog in between Tom and Tyler Austin’s chucks. One of the main reasons that this movie got reviewed was due to the fact that three of the main characters wear chucks, Tom Austin (Patrick Muldoon) in grey high tops, Tyler Austin (Michael Campion) in black high tops, and Mira Perry (Brooklynn Prince) in light purple low tops. It’s too bad Jonathan Silverman, the other main lead in the story didn’t reprise wearing a pair of black high tops like he did in the 1980s television series Gimme a Break. You also see a number of other kids wearing chucks at the two science fairs. The best close up scenes are when Mira is on the roof and when Robo-Dog is standing with the Austins. The camera shows a closeup of Mira’s purple low top chucks. Robo-Dog: Airborne. (2017) Michael Campion, Patrick Muldoon, Jonathan Silverman, Kenny Beaumont, Brooklynn Prince, Alicia C. Del Aguila. Directed by Tony Giordano.